So what’s the fuss with “analytic applications”? Why will analytics transform how applications are developed? How does the cloud ecosystem get affected with the application of Big Data analytics? But first, lets look back over the past 10 years to understand how cloud computing has evolved…before we predict what is going to happen with Big Data analytics in the foreseeable future. The above graphic shows when various companies and services were launched – IaaS + Infrastructure Utility offerings, SaaS offerings, and then a sliver of PaaS offerings in between. You may argue where certain companies are placed – SaaS, PaaS, or IaaS – especially given that, if you have a GUI sitting on top of a cloud service, you can almost always market yourself as a SaaS offering. Since everything requires a web GUI, what really determines whether Gartner or other analysts classify you as a SaaS, PaaS, or IaaS offering is really a matter of target user (e.g. business user, application developer, data scientist, or IT). I’ll leave this for debate. When looking at the top SaaS categories and adding up annual revenue across them all…it pencils out to several billion. This is sizable compared to all the PaaS offerings added up…but it’s smaller than the infrastructure spend powering IaaS and Infrastructure Utility (including both public and virtual private clouds). Over the past 10 years, we’ve seen some phenomenal growth by companies like Salesforce, which has experienced growth from a startup in 1999 to over $2.2B in annual revenue in 2012. However, SFDC is the largest player (compared to any other) leaving a “long-tail” of revenue from much smaller SaaS companies. In the end, the SaaS cloud market is over $14B in size and experiencing a CAGR of at least 16% as reported by Gartner. 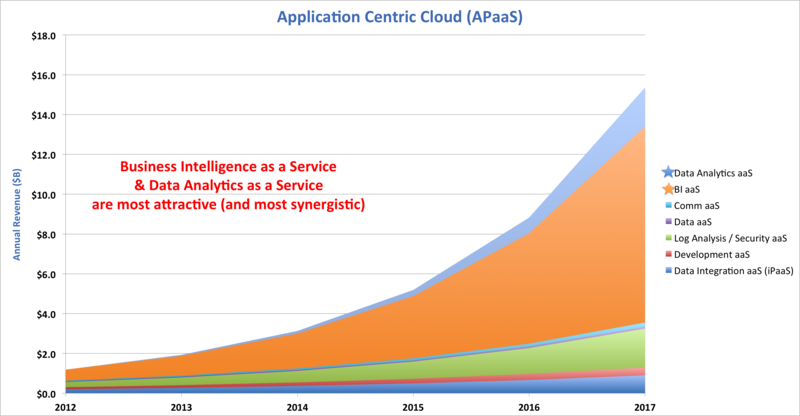 Data Integration aaS (also referred to as iPaaS): Companies like CastIron started this segment with an appliance model back in 2001, followed later by next-gen cloud companies like Snaplogic in 2006. Informatica began offering its cloud service in 2010. This segment attempts to make data integration easy by deploying via the cloud. This cloud segment is young and estimated to be $200M in size and growing at a CAGR of about 35%. Development aaS: Not to be confused with the general PaaS category (which is application developer centric). In this segment companies provide developers support with their code repositories (e.g. GitHub, or CollabNet), development environments (e.g. Cloud9 IDE), or development processes (VersionOne) via cloud services. This cloud segment is also fairly young and estimated to be $100M in size and growing at a CAGR of about 30%. Log Analysis & Security aaS: This segment has received much attention due to Splunk‘s success (which, depending on analyst, could be categorized as application management, business intelligence, or security information and event management). Recent startups like Loggly and SumoLogic have entered with the promise of penetrating a very large legacy market. When looking at just the cloud segment (not including the on-premise market) this is sized at best to be 10% of a $32B operational intelligence market, growing at as much as 50% CAGR (challenged by slow migration from on-premise solutions). This also includes SIEM as-a-Service. Data aaS: This category consists of dataset curators like Factual, Gnip, Datasift, Amazon Data Marketplace, and Azure Data Marketplace. 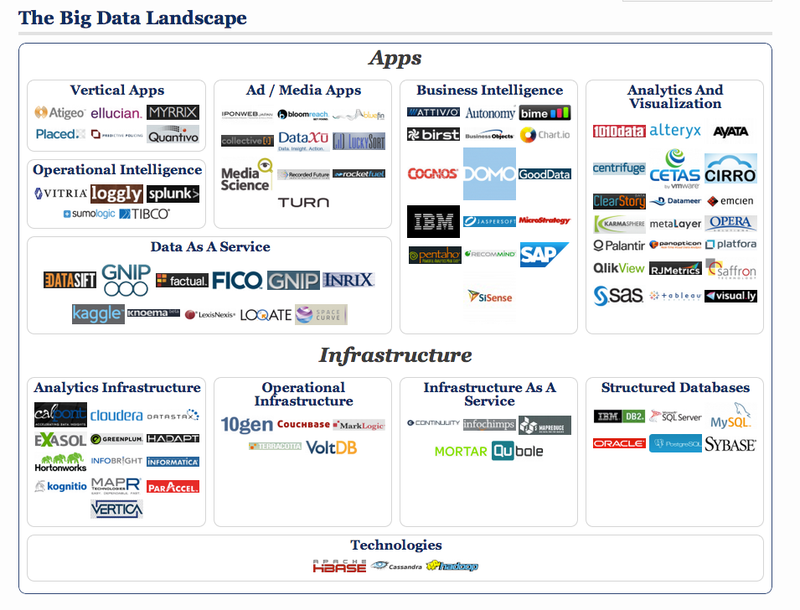 See recent VMware-sponsored “Big Data Landscape” here. Serving up third-party data to augment your own data is a market that is well established with incumbents like Neilsen, Epsilon, Equifax/IXI, and similar “data houses”. However, these incumbents not only provide data augmentation but also a suite of marketing services. The “data marketplace” market, Data aaS, is still too small to quantify, unless we include the service revenues from the established incumbents. Communication aaS: Companies like Twilio, Freespee, and Tropo are looking to disrupt by providing communication services over the web. These cloud services are also very nascent and difficult to quantify. However, they promise to disrupt a large market with established non-cloudy incumbents like Avaya, Alcatel-Lucent, and Cisco. BI aaS: This segment has received the most attention, having been started as early as 2000 (1010data) or 2004 (Birst), challenging incumbents such as IBM Cognos, SAP Business Objects, and Microstrategy. The incumbent BI market of $10B is an attractive opportunity to disrupt. Companies such as Birst, Cetas, Platfora, QlikView, Datameer, Domo, 1010data, and Gooddata are a few of the challengers using a cloud model. Because the market is still young, it’s estimated to be $600M with a potentially attractive CAGR eight times higher than that of the established BI market (8 x 9.7% = 78%). A compelling characteristic of this cloud segment is that it applies to any vertical. With this estimated growth rate, it could approach the current size of the on-premise BI software market at close to $10B by 2017. Data Analytics aaS: This is also referred to as Big Data as a Service. This market is too young to size today, having just launched with companies like Infochimps’ Big Data Cloud launch in 2010 and Qubole in 2012. Others in this segment include Continuiity, Verticloud, Mortor Data, Treasure Data, Metascale, Precog, Algorithms.io, BigML, Grok, and Context Relevant. Although young, this market has a similar profile as BI in terms of it’s broad application and ability to disrupt a large number of incumbents. This market segment also expands beyond the simple three-tier web application model, by incorporating elements of real-time, ad-hoc, and batch analytics into an application development framework that makes the original ISP/ASP Eras seem like child’s play. If you follow EMC’s logic, this market is expected to be a $2.55B by 2015, which would equate to 15% of the overall Big Data market ($17B) with a CAGR over 600%. I’m bullish, but my estimate for this cloud market is $2B by 2017, not 2015 (an estimate of about a 150% CAGR). Another interesting projection is TechNavio’s forecast for the Global Big Data-as-a-Service market at a CAGR of 68.93% over the period 2012-2016, or TechNavio’s Global Hadoop-as-a-Service (HDaaS) market to grow at a CAGR of 95.16% over the period 2012-2016. But these roll up solutions from vendors like EMC Corp., Microsoft Corp., IBM Corp., and Google Inc., which I think actually confuses things and ultimately brings the projected CAGRs down. The total PaaS market is $1.2B in 2012, reported by Gartner. However, it’s the fastest growing segment of cloud. And based on the above assumptions, the most attractive markets within PaaS are : 1) BI as a Service, and 2) Data Analytics as a Service. As I discussed in the “New Cloud Ecosytem“, infrastructure as a service will expand beyond “public cloud” and into third party Tier3-4 data centers with”virtual private clouds”. Using Gartner’s view (below) of the infrastructure market, you can see that at the simplest level, hosting (e.g. dedicated managed hosting) the growth rates are the slowest (whether provider-managed or customer-managed) between 4.3%-15.3%, followed by Infrastructure Utility between 32-34%, and pure-play Cloud Computing at 47.8%. I think these are exciting times because many CIOs are moving to a 30/70% split mix of in-house data center / outsourced data center. We’re going to see a healthy growth (32-47% CAGR) of outsourced clouds within a combined market of $15.5B (provider-managed, shared/private-hybrid cloud at $14B + $1.5B PaaS only). There’s a very large market opportunity building new clouds within Infrastructure Utility providers like AT&T, Savvis, Verizon/Terremark, Telsra, etc, moving beyond the simple three-tier web application architecture, and providing dynamic analytic data services. 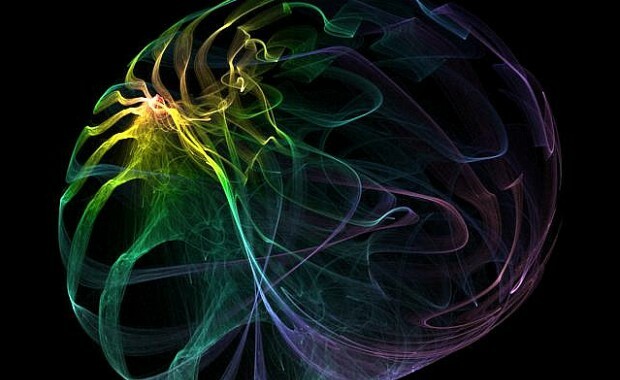 More to come on this topic in “Big Data Predictions for 2013” below.